The following is a list of moments of inertia. Mass moments of inertia have units of dimension mass × length2. It is the rotational analogue to mass. It should not be confused with the second moment of area (area moment of inertia), which is used in bending calculations. The following moments of inertia assume constant density throughout the object. NOTE: The axis of rotation is taken to be through the center of mass, unless otherwise specified. 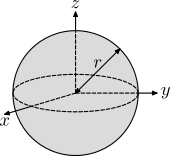 Thin cylindrical shell with open ends, of radius r and mass m This expression assumes the shell thickness is negligible. It is a special case of the next object for r1=r2. This is a special case of the previous object for r1=0. Keep in mind that m in this case is greater than in the previous one. This is a special case of the previous object for h=0. This is a special case of torus object for b=0. Solid sphere of radius r and mass m A sphere can be taken to be made up of a stack of infinitesimal thin, solid discs, where the radius differs from 0 to r.
Hollow sphere of radius r and mass m Similar to the solid sphere, only this time considering a stack of infinitesimal thin, circular hoops. For a similarly oriented cube with sides of length s, . Rod of length L and mass m This expression assumes that the rod is an infinitely thin (but rigid) wire. This is a special case of the previous object for w=L and h=d=0. (Axis of rotation at the end of the rod) This expression assumes that the rod is an infinitely thin (but rigid) wire. ^ Classical Mechanics - Moment of inertia of a uniform hollow cylinder. LivePhysics.com. Retrieved on 2008-01-31. This page was last modified on 16 February 2009, at 09:06 (UTC).